Mirepoix lies 18kms/11mls south of Fanjeaux where we are currently enjoying a very mixed bag of southern French weather. 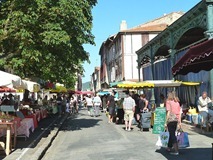 Mercifully, on market day (Monday) the weather was fine and hot. 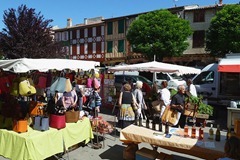 In addition to most French street markets being colourful affairs, Mirepoix is itself very colourful with many timbered 13th century buildings and cloisters. This makes it both a fascinating and, of course, a very popular destination. In early June, before the main tourist season, visiting on market day is quite enjoyable but in July and August we’re told it’s best avoided. 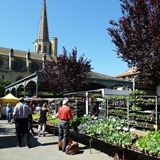 In three different formats for a little variety, here’s a few pictures which will hopefully convey a little of the atmosphere and flavour of Mirepoix and its market. A couple of the pictures show some of the old metal market halle in and around which much of the modern market clusters. The spire of the Cathédrale de St. Maurice towers above the lot. 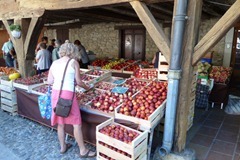 We wanted to visit Mirepoix market on this occasion for two specific purchases: a field guide to mountain wild flowers, to help Francine identify vegetation she found in the Pyrenees, and some pêches plats [flat peaches]. Francine had spotted les pêches plats on previous occasions but had avoided them thinking that they might be all stone and little fruit. However, having spotted a local making off with several kilos of the things at Bram market recently, she thought, “they must be fine, we’ll try some”. [Ed: this is actually unsound logic – I’ve tried a pied pané, a breaded pig’s trotter, and all I could find edible were the breadcrumbs.] Not only did the pêches plats have very small stones but their flavour was wonderful, a little more perfumed than regular peaches. The season is short and we wanted some more while they were available. Here’s Francine raiding one of the many fruit stalls, carefully selected as having French rather than Spanish pêches plats.